WSHS Drama High presents a Dessert Theater performance of Sideways Stories from Wayside School. 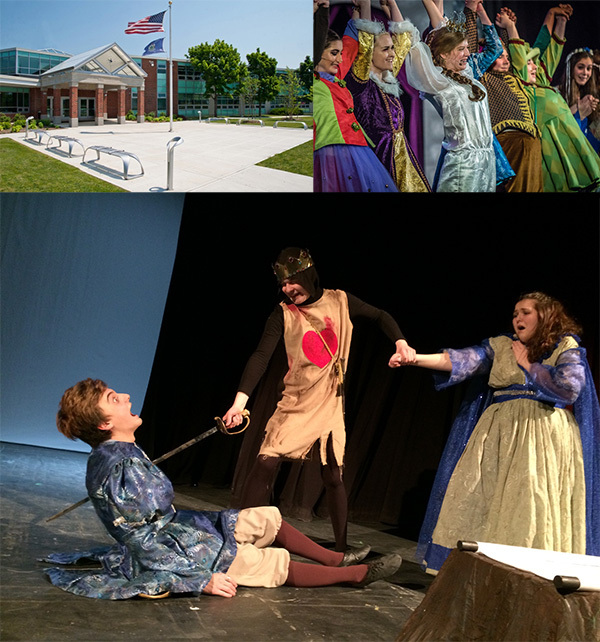 The drama program at Waterville Senior High School allows students the opportunity to explore many aspects of the performing arts within many different venues. The drama year varies slightly year to year by usually consists (SEE CALENDAR) of a fall variety show, November musical, March one-act play competition, spring mystery dinner show or spring production. Given time and money, we also invite a guest artist to teach a workshop perhaps on improvisation, stage fighting, make-up or costume design. Aside from singing, dancing, acting, and playing of musical instruments, our students have an opportunity to learn to stage manage, direct, build sets, run lights and sound equipment, crew a show and many other technical endeavors. 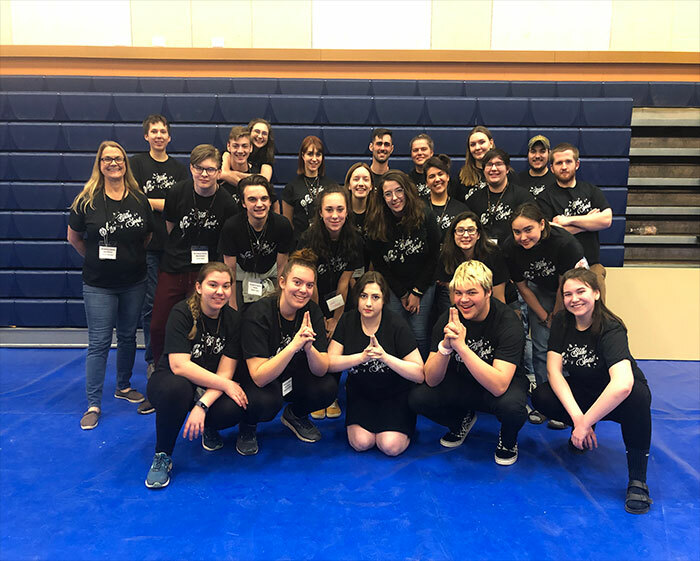 The students enjoy performing for their peers at WHS, but they especially enjoy performing out in the community and around the state each year where they get a chance to share their talents with others and see what other high schools are doing in the performing arts. The one-act play competition has been a great vehicle for this kind of touring. Within the drama club, there is the ability to earn membership to the Thespian Society, an international theatrical honor’s society. To know more about the Thespian Society see our side menu. To become a member of the drama program, only interest and perhaps a bold heart are needed. Everyone is welcome to audition for any of our shows or be involved as a “techie”. Overall, the drama program fosters teamwork and disciple while having a great time. GIVE US A TRY! Look up actor in many careers publications, and the message can be dispiriting. Yes, it’s hard work, the hours are long and unsocial, regular employment is unlikely and, for many, income may be limited and need to be supplemented by temporary periods of alternative employment. But acting is a profession in which the personal rewards are immense. After all, how many careers are there where you can make a living doing something that you really want to do? And for a significant number of actors, the financial rewards can be very healthy indeed. Of course, not everyone is going to achieve an illustrious career. But for many others, sufficient income can be generated by work in theater, film, television, and radio to provide a decent living for the individual and a family. Check out MITOPENCOURSEWARE Music and Theater Arts to take acting courses. This is a great source of material on becoming an actor and it’s free! Cast and Crew of Blithe Spirit at the Regional One Act Play Competition in Brewer. Thank you Cast and Crew for all your hard work. Should I Choose A Drama School After Waterville High School? No-one denies that acting is an increasingly competitive profession. It, therefore, makes sense to have as many advantages under your belt as possible. And certainly training at a recognized drama school is one of the greatest advantages of all. It provides not only the discipline, practical skills and intellectual understanding necessary for a lasting career, but also opportunities to be seen by agents, casting directors, theaters and television companies, so vital to securing that all-important first job. What Careers Can Drama Majors Pursue? Like other liberal arts graduates, drama majors pursue a variety of careers. Some graduates apply their skills of critical reading, writing, and thinking to fields as diverse as business or law. Other graduates remain within the field and work in their chosen area whether as actors, designers, directors, or dramaturges; as managers of theaters or arts organizations; or as critics and teachers. All of these career paths require forethought; some require graduate study. Check out this link on careers in drama. 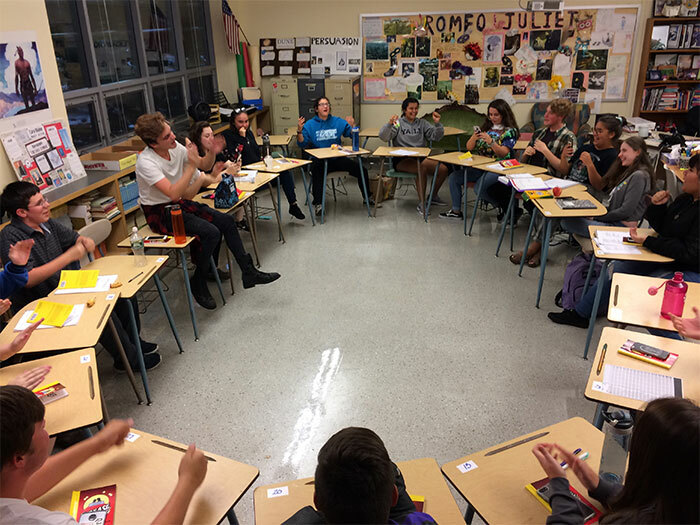 As always, the first read through always takes place in Ms. Giguere’s room. Above the first read through with the leads of this year’s musical Grease. No-one denies that acting is an increasingly competitive profession. It, therefore, makes sense to have as many advantages under your belt as possible. And certainly training at a recognized drama school is one of the greatest advantages of all. It provides not only the discipline, practical skills and intellectual understanding necessary for a lasting career but also opportunities to be seen by agents, casting directors, theatres and television companies, so vital to securing that all-important first job.